On a night when longtime Dallas franchise player Dirk Nowitzki made some NBA history, lesser-known names like Kenrich Williams, Frank Jackson and Cheick Diallo helped New Orleans pull off a much-needed, comeback victory. 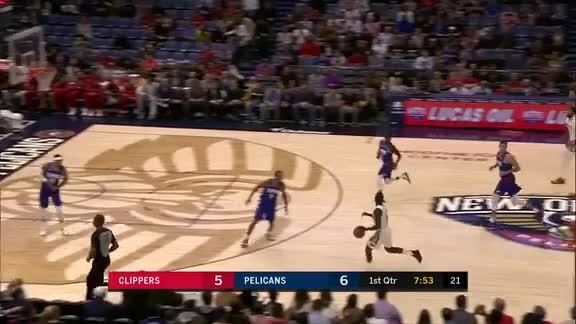 The New Orleans Pelicans looked like they were clearly headed to their seventh consecutive loss. Dallas held a four-point lead with 18.9 seconds to play. Alvin Gentry speaks to the media following the Pelicans overtime win against the Dallas Mavericks. Julius Randle speaks to the media following a strong performance against the Dallas Mavericks. Former New Orleans Pelicans guard Tim Frazier has found a home where he started the 2018-19 NBA season. Elfrid Payton puts up his fifth consecutive triple-double and leads the way to a Pelicans OT win. Elfrid Payton speaks to the media following his fifth straight triple double against the Dallas Mavericks. Pelicans point guard Elfrid Payton became the fifth player in NBA history record a triple-double in five straight games on Monday night against the Mavericks. On Tuesday, New Orleans Pelicans guard Elfrid Payton recorded his fifth consecutive triple-double. Where are the New Orleans Pelicans in the race for the No. 1 pick? The eyes of many New Orleans Pelicans’ fans have drifted away from the court in the final month of the season and onto the standings. The New Orleans Pelicans were officially eliminated from the 2018-19 playoff race on Monday night while the team was still on the court against the Dallas Mavericks.